Dont you just hate missing plans and recipes when you're out exploring, well no more! 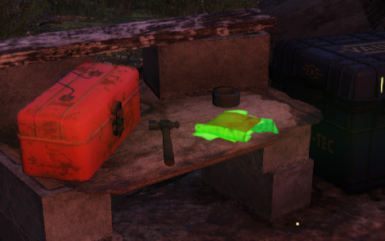 Recipe books and Plans now glow a beautiful green. Due to demand, i have added a purple glow option for users that are colourblind! Due to a messed up texture in the main, delberts was defaulting to ANOTHER texture instead, Delberts has now been fixed! so all recipes and plans now glow! Add Glow.ba2 to your archive load list in Fallout76Custom.ini. directory and run the baka file tool. The main Glow.ba2 is not needed for Baka File Tool users.